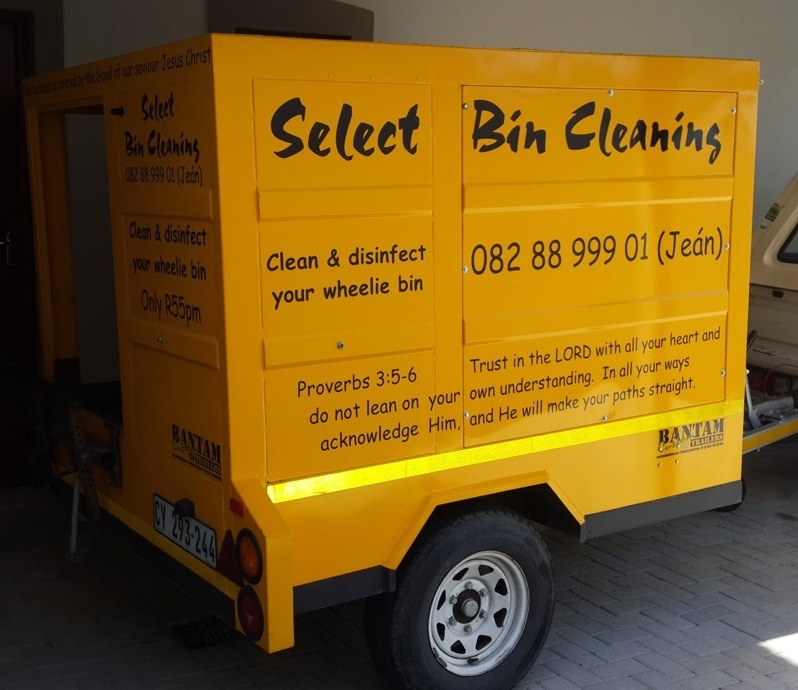 Select Bin Cleaning offers a decontamination service by washing and disinfecting municipal wheelie bins in Durbanville and its surrounding areas. We offer multiple plans to suit your all requirements. If we don’t have a plan that suits you, please get in touch so we can put a tailored package together for you. Have you ever lost your bin? We’ll label your bin with a neat weather proof sticker so that your clean bin never gets lost (or swapped by an envious neighbour). Neat eh? We’ll clean your bin every second week. We use a mixture of sweet smelling cleaning products to make your bin smell like a candy store. Lastly, we’ll disinfect your bin(s) to ensure that no foul smelling bacteria will stand a chance and that no unwanted pests are enticed into your yard / bin room. Select Bin Cleaning was founded in 2014. We contribute to society by employing those who need work the most – ordinary South Africans. We have many satisified clients all over the Northern Suburbs and pride ourselves in delivery excellent service to all our customers. Dirty bins are a breeding ground for dangerous germs and bacteria. Rats, mice, cockroaches and other unwanted pests are attracted to the smell of rotting and decomposing material and bring with them a host of nasty pathogens which can have serious consequences to the health of your family and pets. What’s more, a smelly bin has also been linked to a allergic reactions stemming from the inhalation of the same bacteria causing your bin to smell. Select Bin Cleaning is a month to month service business which puts you in control of your finances.